A few months ago a friend asked me for some advice about shopping at Ikea. Since I have practically furnished my entire house with Ikea purchases I felt like I had some good advice to share. Later I saw a Facebook post about her Ikea experience. I’m not sure I had prepared her well enough. In order for this to never happen again, I’ve prepared Tips for Shopping at Ikea. This list will help you get the most out of your Ikea trip and you won’t go home with items that may have to be returned. Don’t go to Ikea in July or August UNLESS you go on a weekday when the store opens. Otherwise you’ll regret it. One of the first Ikea rookie mistakes we ever made was the time of year that we planned our visit. In July and August the latest Ikea catalogs come out. Combine that dynamic with a flurry of college freshmen stocking up and you have a madhouse. We’ve made this mistake before and let me tell you, it is so crowded that you can’t see what’s there and it is impossible to move through the store. Even if you arrive when the door’s open, you’re not going to make progress. You’ll likely stop in the restaurant and only make a ridiculous impulse purchase. If you have a college student who needs a room outfitted, go in June. If you need furniture for a new home, wait until September. That said, sometimes there is a fabulous new item found in the latest catalog. These items tend to go fast and restock slowly. Be there as soon as the doors open and follow my directions below. You will likely snag said item. If you wait, you may end up like me, waiting months to get an item. 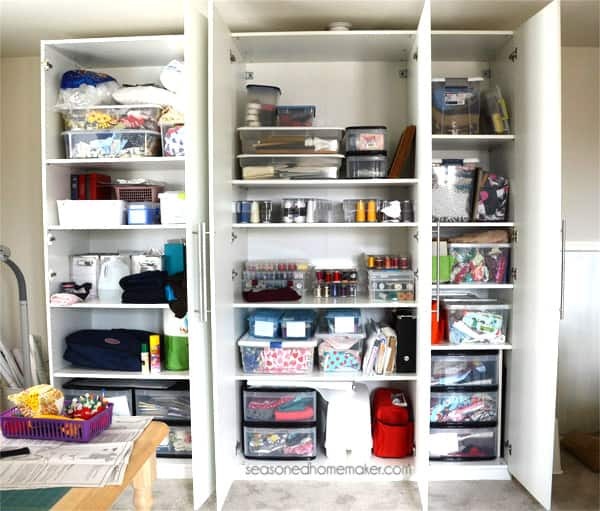 We began planning my sewing and craft room well before we ever visited Ikea. Even when the house was being built we would think about where to put things. I had this plan of attaching Pax units into wall niches to store all of my supplies. According to the measurements I had seen online, the Ikea Pax cabinets would slip right into those two niches. Clean and tidy. That plan was impossible because the Pax system didn’t make a door that would work for the cabinet that fit the niche. The cabinet we chose was meant to be a closet organizer and didn’t come with a door. The key to this information is found in what is called an Ikea Buying Guide. The Buying Guide tells you the exact size, color choices, hardware, doors, etc. When we studied the Pax Buying Guide, we realized we had to adjust our plan. In my opinion, studying the Ikea Buying Guides for items we thought we would buy saved us a ton of grief. 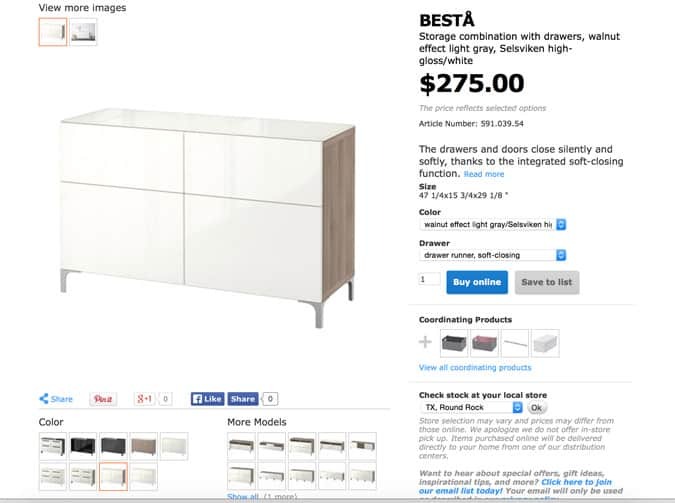 All of the details for all of the pieces and parts to specific Ikea lines (Besta, Hemnes, Pax, etc.) are available in the Ikea Buying Guides. We were also able to be a little creative and customize some of our pieces. We would look at the line drawing in the Buying Guide, then look it up online. This allowed us to see everything that was available, the sizes, the parts (like legs), the colors, etc. We were then able to decide exactly how we wanted something to look AND if it would fit into our space. 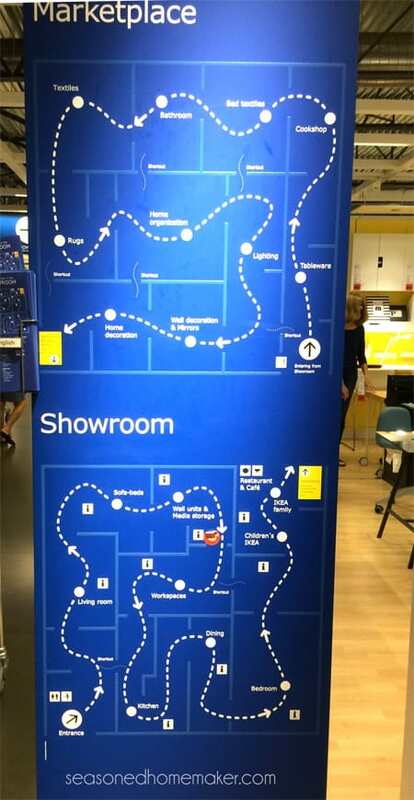 Every Ikea has a store map that is divided into two sections: The Showroom and The Marketplace. Sometimes these are on the same floor and sometimes they are divided into more than one floor. Take time to study the map and look for the shortcuts. The key to getting out of Ikea in one piece is knowing how to navigate the store. On the map you will see that there are shortcuts that can help you bypass walking through the entire Showroom or Marketplace. If you are on the hunt for dining room furniture, cut through and go straight to dining rooms, etc. If there is anything I’ve learned about shopping at Ikea it’s this: Shop one room at a time. If you try to pick up dining room chairs, a desk for the office, and a kid’s bed you will want to shoot yourself. Even worse, if you are shopping for a college dorm or apartment, you may need to work along side someone you are meeting for the first time. Pick a room. Look online for the things you need. We did this when planning our home office. We went in with a specific plan and knew exactly what we wanted to get. Since we were focusing only on this room, we were able to make some last-minute in-store decisions which turned out great. By only focusing on this one room, we made great choices and didn’t spend a fortune. Studying the Buying Guide ahead of time helped us create something that fit a unique space. We needed a tall, skinny-ish cabinet for the space between a door and wall in the office. 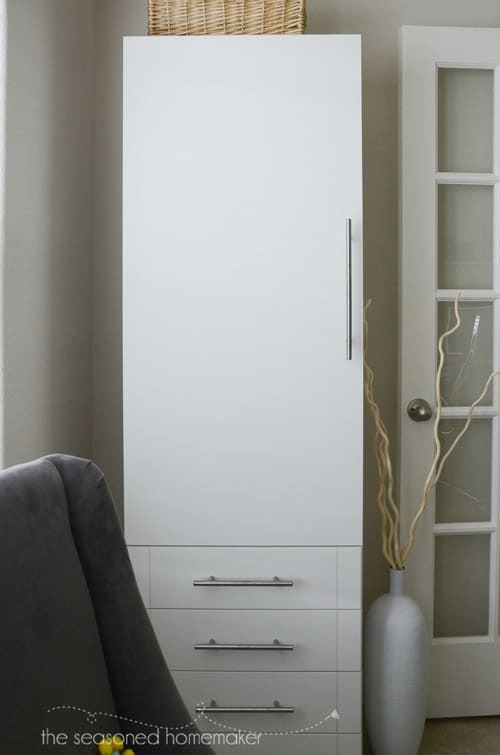 My husband realized that the Besta line was very flexible so we studied the Besta Buying Guide and customized this cabinet using a cabinet base, doors, and drawers. This specific cabinet is not shown anywhere online or in a catalog. We put the parts together and came up with it ourselves. And, saved a ton of cash. You’ve done your homework, shopped smart, and chosen wisely. You have checked out and are ready to load your vehicle. It would be sad indeed if you were to make a purchase only to then find it won’t fit into your vehicle. You need all of these measurements with you in the store. The Buying Guides help you know approximately how big the assembled item will be, but you need to go one step further. Have ALL vehicle measurements. This includes how wide your vehicle doors open, how much height you have inside the vehicle, and cargo length space. Of course, you can always pay Ikea to deliver. Even if everything fits into your vehicle, you may have difficulty getting the larger flat boxes into areas in your home. If you have a short hallway a large piece may not fit around corners, through doorways or up stairs. We had this happen with the Pax cabinets that we purchased for my sewing room. The turn from the entry into the hall and up the stairs was very tight. We knew this going in and had a plan for getting the pieces up to my sewing room. Knowing in advance allowed us to understand ahead of time if it was even possible to get the larger pieces up the stairs and into my sewing room. Be sure to measure hallway openings, corners, and stairway height. Know all of these before you leave for Ikea. Wouldn’t you hate having to turn around and return everything because it doesn’t fit around a tight corner in your home. The closest Ikea to my home is about an hour away. I would hate to drive all that way to find out the coffee table I want is unavailable. If you’ve done your homework, you can find this out easily. 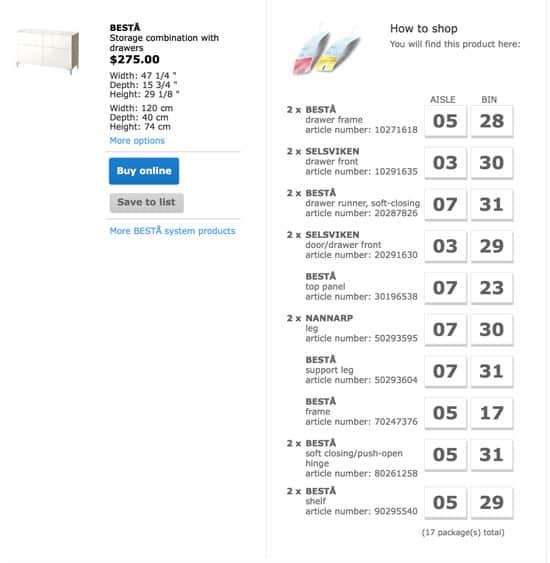 Go to Ikea.com and open the page to the item you want to purchase. Find the store you plan to visit and check the inventory. It will give you an inventory prognosis. Click on the button that says: Click Here to View Stock Prognosis. The image below gives you the best estimate of product availability for the the next few days. It’s not a guarantee, but it certainly lets you know if something is out of stock. The image also lets you know the Aisle and Bin number where you can find the item. 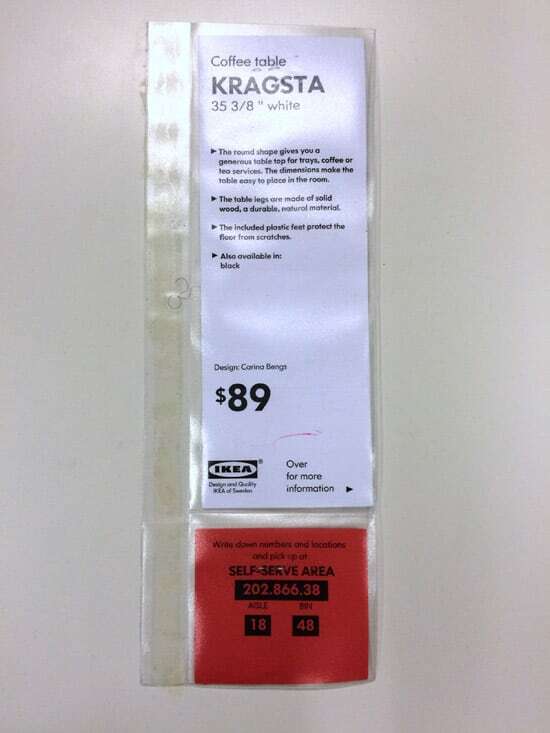 We always carry this information with us when we go to Ikea. It helps if you are short on time and want to pop in, pick up your item, and checkout. Lastly, the exact size of the packaging is available online. 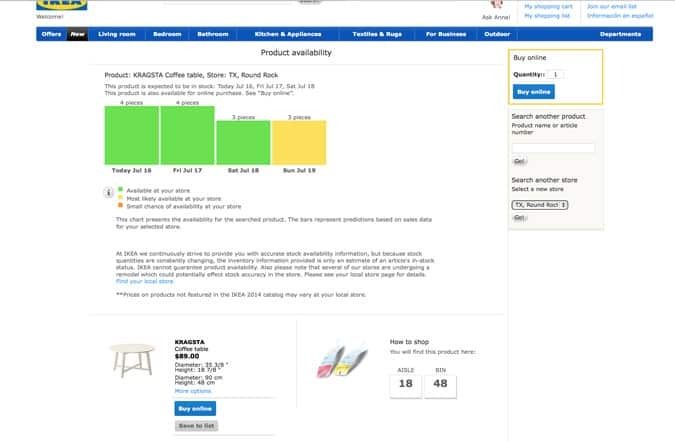 Click on Product Information and scroll to the bottom of the page. 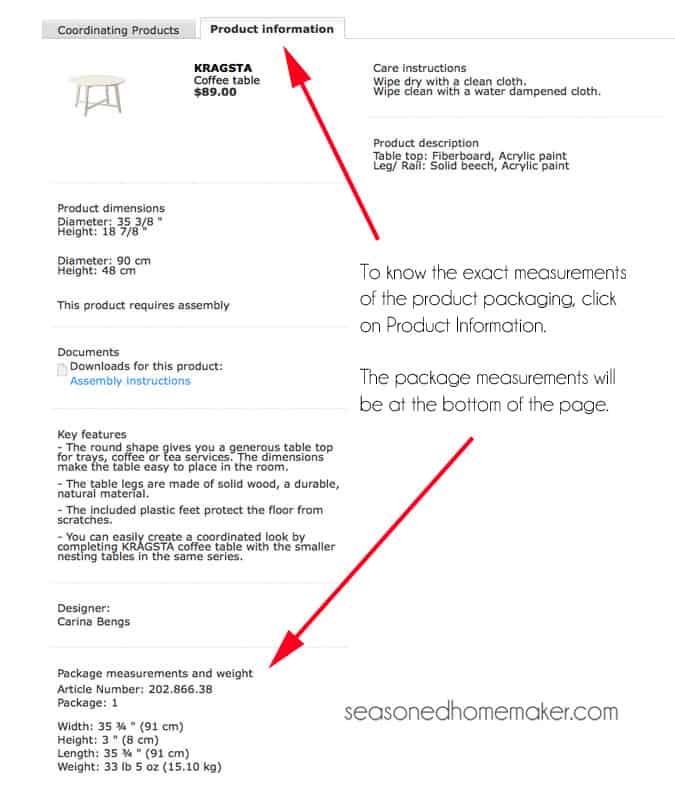 There you will find the exact measurements of the packaged item. It’s a good idea to know if the package will even fit into your vehicle. You’ve executed your Ikea Shopping Plan and now know what you want to purchase. Knowing the Aisle number and Bin number only get you to the exact location of the item you want. 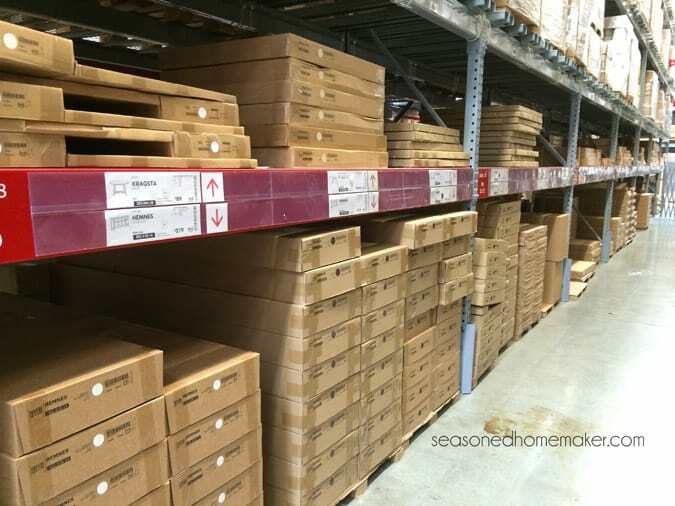 Keep in mind that there are a ga-zillion things in the Ikea warehouse. You’re going to need to think and choose carefully. You’re on the correct Aisle, you’ve found the correct Bin. Don’t just grab and go. Notice how there are these red arrows that go Up and Down. Pay attention to this because many of the packages are similarly shaped. Be sure to choose your selection from the correct Bin and then verify all numbers and the color. Snap a photo of the item in the Showroom. It will have the Article, Aisle, and Bin numbers so you can verify before loading your cart. Or, find the item online before you leave home. 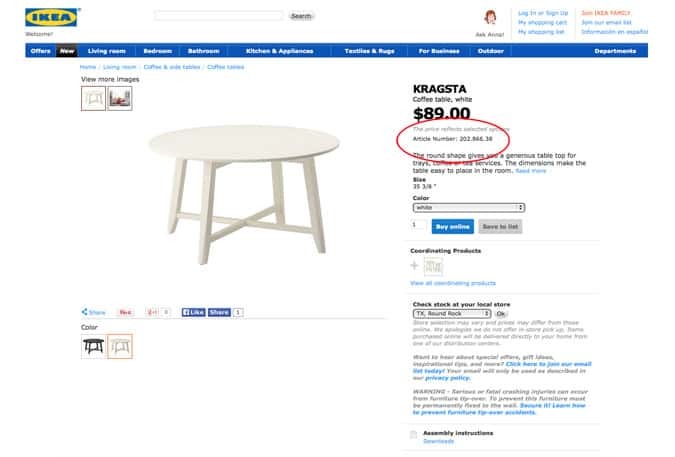 This information is available from Ikea’s website. I write the Article numbers down before I leave home. I recommend this because the cell service in Ikea can be a bit sketchy. Sometimes you select an item that comes in more than one package. This Besta cabinet is a perfect example. Notice all of the different available choices. 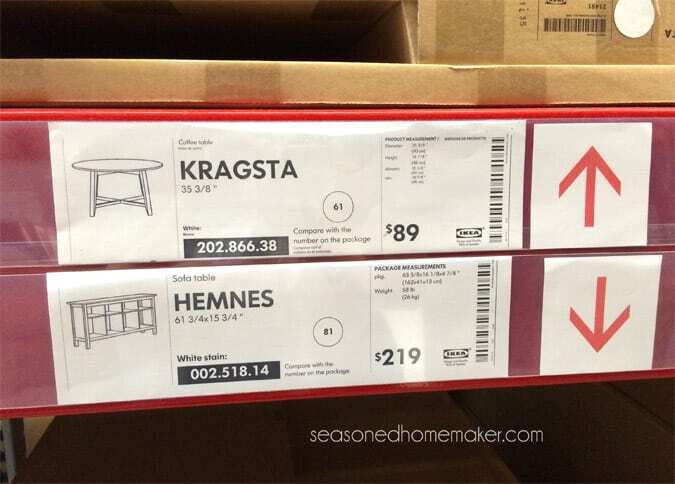 One wrong selection and you are going to be making a return trip to Ikea. The way to avoid getting the wrong item is to check availability of ALL pieces before you leave home. It looks like they have the cabinet in stock. This cabinet has 17 different pieces that you must pick up! (The small coffee table in Step 7 is only one item). Before leaving the store take a minute and match the 17 items with 10 unique Article Numbers. Wouldn’t you hate to get home and find a drawer front in a different color? It is difficult to look in a catalog, choose an item that needs assembling, and purchase it without seeing it first. That means you will need to take the time to shop at Ikea and see what you like. Study the different furniture lines and see which ones match your style. Ideally, doing this means the store isn’t crowded. Week days when the store opens are generally a good time to shop. However, we have found that Saturday evening is the best time to shop. The store closes at 9pm, but the crowds start to thin out after 6pm. We usually make an evening of it, get an early dinner, then shop for a couple of hours. We’ve even run into friends doing the same thing! 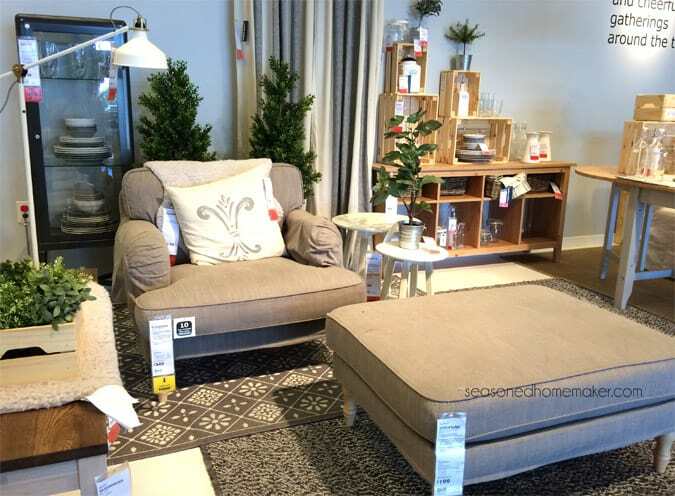 Ikea is one of those places that can save you a ton of money on home decor and furnishings if you make the most of it. Or it can make you lose your religion. Having a plan insures a successful Ikea visit! I read this article in the hope that it could save us the awful stress that usually goes with a trip to Ikea, and I think you’ve done a great job. However, I do have a story to tell with regard to the stock levels showing on the website. I went to the store recently for a particular item and checked availability online before leaving home. It clearly showed that there were 4 in stock, and I figured it was unlikely that they would all have sold in the 30 minutes it takes me to get there, so off we went. When we got to the store we went straight to the department we wanted but couldn’t find the item. We eventually located a member of staff who told us the item was out of stock, we queried this and he checked the website – it was still showing 4 in stock, so he told us that the 4 in stock must be ‘faulty’!!! We picked up a couple of other items and left the store feeling quite cross as we’d made a special trip based on the stock levels shown. When I got home I checked the website and it still said that there were 4 in stock, which made my blood boil – shopping in Ikea can do that to you, lol, so I contacted Ikea via online chat. Initially they tried to wriggle out of it by saying that the stock levels couldn’t be relied upon as obviously items can sell out between leaving home and arrival at the store, but when I pointed out that they were still showing 4 in stock, the guy I chatted to finally agreed to deliver the item for FREE! I was really relieved as I have a disability which makes shopping at Ikea even more of a nightmare, and I’d been unable to find anything similar elsewhere, plus the idea of paying the CRAZY fees that Ikea charge for delivery was very off putting. So I think my advice would be that if you’re making a special trip for a specific item, even if it shows as ‘in stock’ online, I would phone the store and check with them that they actually do have it, although whether or not they would be prepared to physically go and check and put the item aside remains to be seen. I agree. Phoning ahead for low stock items is always a good idea. Fortunately, I’ve never had this happen. 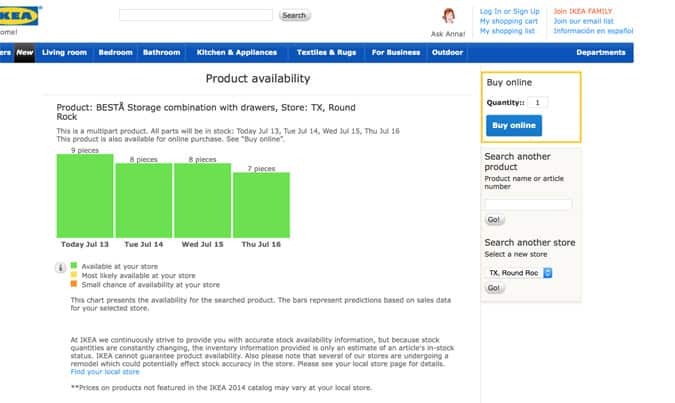 Usually, the Round Rock, TX store inventory matches what is online. With so many Ikea’s world wide, I’m sure that this can be a challenge. It’s great that Ikea delivered for free when their stock didn’t match. This happens with all big stores, not just Ikea. As Leslie recommends, I always phone ahead to check on the real inventory. Thanks so much for the tips. Good to know about not shopping in July or August. I have to drive 2.5 hours to get to one so glad for that tip We had our first experience when we moved to Germany luckily I had brought a catalog from the US and we would show the employees what we wanted and then they would show us not tell us since we did not speak German where it was. That is hilarious! What’s true in one Ikea location is not necessarily true in another. I have furnished more than one place at Ikea, and have never run into the madness you describe. For me, going to Ikea is a real treat, and I always plan on making a day of it. I take my time, visit the whole store, admire the beautiful room designs, eat one of their horrible meals, and pick up what’s on my list as I come across it. 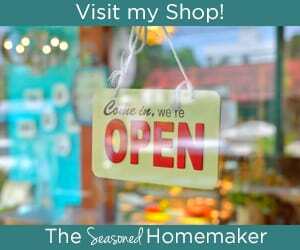 There’s magic in that store – just succumb to it! Wow, I have never been to this store before and this makes it sound a bit scary! I will be sure to be armed with this battle plan if we ever make a visit. I love to be well informed! I’ve never purchased an entire kitchen from Ikea. However, I know they have a book at the store on how to do this. I would suggest getting the book and studying it before making an appointment with one of their kitchen designers. It will probably require more than one trip. I have done a whole kitchen with Ikea components, and used their installation service. It was the best and cheapest kitchen I ever had. I would certainly do it again. We have bought a lot of the Billy bookcases, both with and without doors. Sometimes the finishes change a little; if this would be a deal breaker for you, try to get everything at the same time. We couldn’t do that as we needed to make purchases as we could afford them, but we got lucky and the bookcases didn’t all line up. Since they are in different places, it didn’t matter as much. Still something to think about. Found you through Frugal Friday! 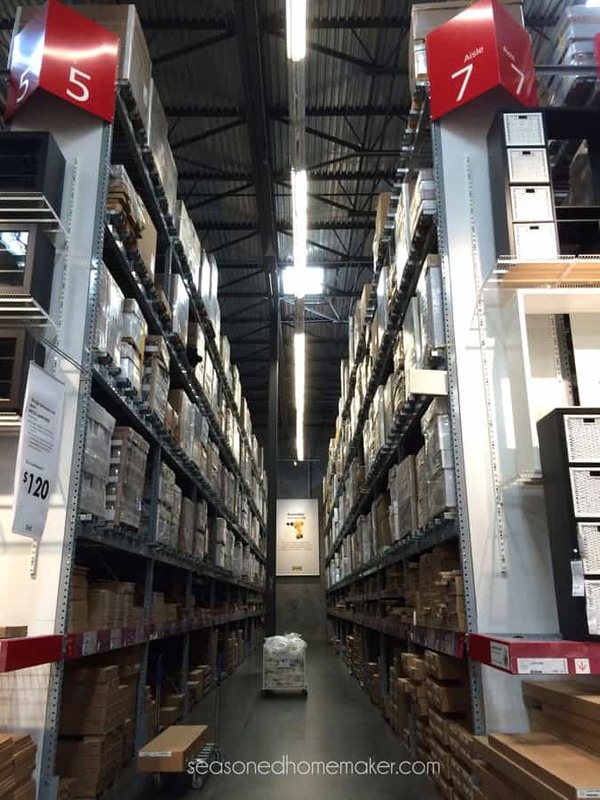 Great tips-we are huge IKEA fans too, I wish I had known these the first time I went. I was totally overwhelmed! Weekends are crazy there, but I’ve also had great luck with Friday nights being pretty empty. We’ve done Friday nights, too. But it is a bit of a drive for us in the Austin traffic. That’s why we stick to Saturday night. But for productivity reasons, I use a lot of the tips you outlined. In particular, I try to only shop for one room at a time. Even though we have a lot of home improvement projects going on right now, my husband and I limit our trips so that we aren’t overwhelmed by the amount of things we need to carry, transport and set up when getting home. I just got my catalog today! ha I am in the midst of getting rid of things at the moment, but it is fun to look at and dream. Maybe our retirement home will need a kitchen gut and we will try Ikea. I do love their stuff, especially the kitchens items and I enjoy looking at the Ikea hacks on the internet. The Billy built ins are something I would do it there was space for it. It is so easy to get overwhelmed there. Good tips! These are all great ideas!! We have definatly made the two hour drive, found the perfect couch and then drove back down the next day because it didn’t fit in the truck the first time!! My number one tip would be: know what you need, and then don’t bring your mother-in-law. Or your husband for that matter. (My MIL wants to give me EVERY LITTLE ITEM she sees, and my husband checks out all the details in the beginning of the store, and then has had enough when we arrive at the department we need. Ugh). I like IKEA to dwell around, but mostly if it’s on my own terms. You did a great job writing that guide though. I’ll never forget the time when my dad and I picked up a sofa, I managed to squeeze myself into the car too, and then had to bring the whole thing to the third floor, with turning stairs. It worked, because we could unpack and that 5mm of cardboard made all the difference. When we had to move that sofa out again, I warned my uncles who were there to help, but then I saw them coming down within 5 minutes – they quickly discovered two more pieces that could come of. When I told my dad, he almost died right there (laughing though, it’s a funny story). Great tips! We love Ikea but have to drive two and a half hours to the nearest one. We have made mistakes but have learned to know exactly how much furniture we can get into our vehicle. 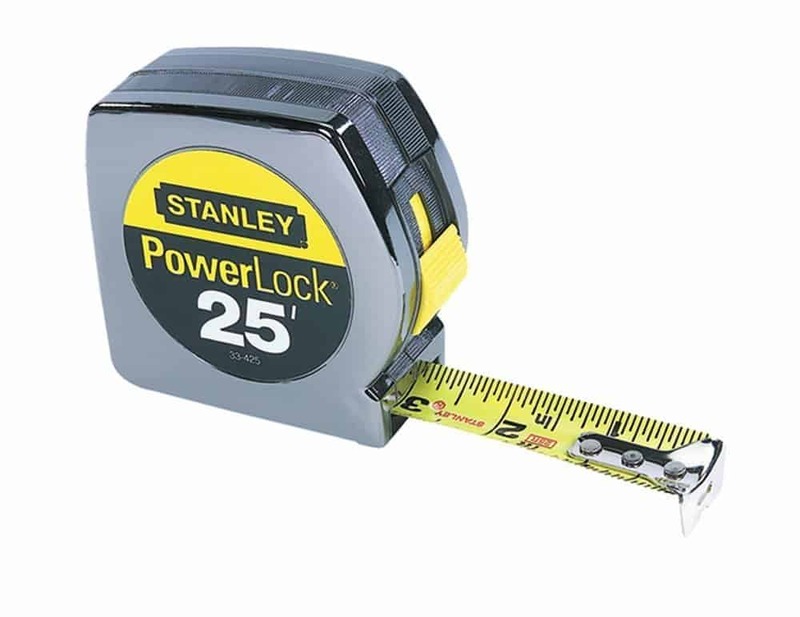 You are right on about taking measurements before you go and taking a measuring tape. Thanks for the advice! Good tips. we’ve been shopping at IKEA since we lived in Hong Kong almost 30 years ago!! Read that fine print on location tags. Get help when in doubt. And don’t bring the kids!!! Babywear if you have to but Ikea is not a good place to shop with kids. I loved this post! We love Ikea and we are probably the annoying people you hope to avoid. We go simply to enjoy the air conditioning the chocolate cake, and the fake living rooms. I like the show-rooms that are 200 sf. I’m always wondering where someone who lives like this puts their stuff…..
I’ve charged through those doors a time or two. I’ll have to remember this! We have our first IKEA opening next month in STL so this is good timing. I’ve been a few times in other cities, but now that I’ll be a regular, it’s good to have some tips for surviving the madness of the place. Thanks for sharing. I live in Las Vegas and Ikea is building a store in the southwest part of town which will be ready for shopping in Spring 2016. Can’t wait to actually see the store in person. Been a fan of Ikea and have a few pieces of their furniture which I love. 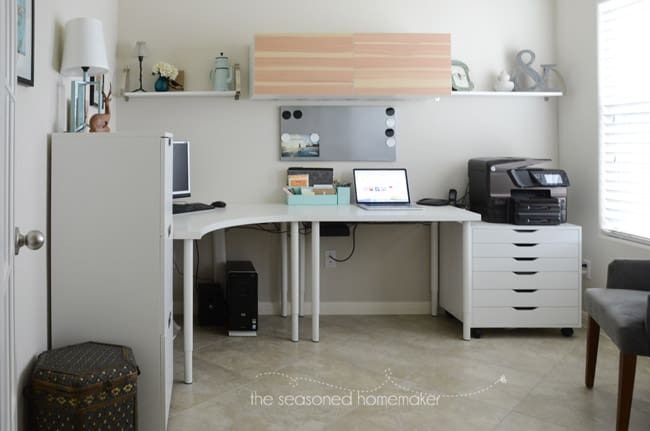 I’m planning to update my sewing room with cabinets, tables, bookcases and your plan on how to shop at Ikea is awesome. Thank you so much for this great article. Thank you so much for sharing these great tips! 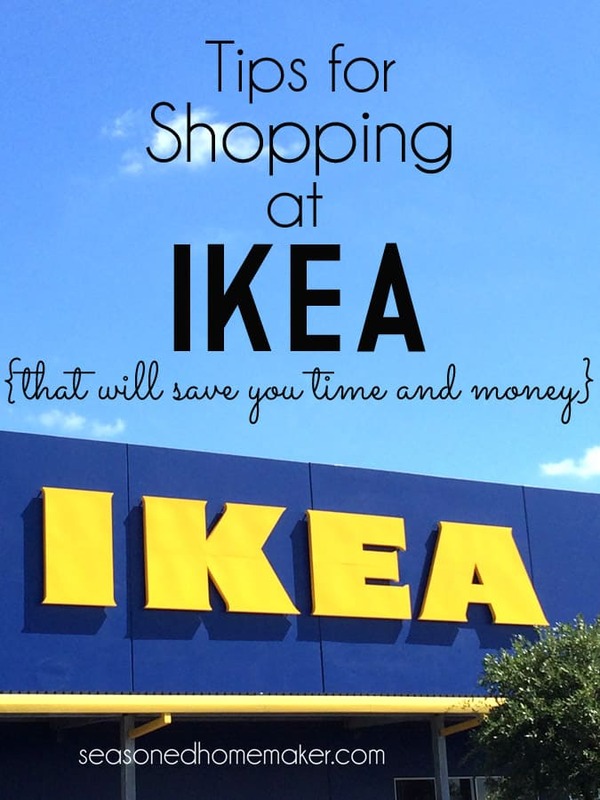 I wish we lived closer to an IKEA but when I get to Seattle or Portland I always take a list! But these are great even for someone who needs to do some planning ahead of time! Visiting from Wonderful Wednesday! Ikea also has extra screws, bolts, dowels, etc you can grab BEFORE you go home. These are in the service department. Nothing is more aggravating than discovering you are missing a critical part to complete your project! You did a great job of covering the basics, I am a frequent Ikea flier myself. A helpful tool that I have discovered most people don’t know is that you can register online and create shopping lists. 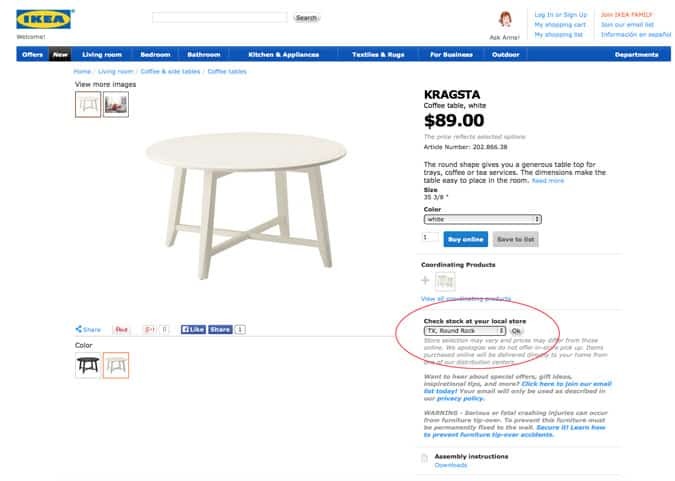 When you are ready to hit Ikea you can email the shopping list to yourself and included in the email is the location of every item along with stock information. Great tip. I will definitely be doing this in the future. This is a great article and so so helpful to all of us who love shopping at ikea. I too live 3 hours away and do not go very often, but when I make the trip, I go well prepared. Thank you for taking the time to prepare this very informative post, I am going to pin it so as to have it for future reference. Thanks for writing this. Some I knew, but you also shared things I wouldn’t have thought of. You are absolutely right. We always try to get there at 9:30. I also love going on Saturday evening. No one is there – but it can be a little picked over. We will eat at the Pei Wei and get a Starbucks before going into the store. Great date night! This is the absolute BEST article! You nailed it in every way! It took me several visits to the Illinois store, I’m in WI, to wake up! You have to know what you’re looking for, make notes, wear comfortable shoes, and by all means check out the cafeteria!! You won’t be disappointed! Happy shopping! Leslie, you did a great job on the write up. Yes, do your homework at home with components, measurements, parts, color, item numbers, weight, height, etc, before you go to IKEA and you will have a wonderful experience. I did research for days to renovate my craft room and I can’t wait to see the finished product. TIP: If the box does not fit in the vehicle, try taking it out of the box. You may be surprised! Happy shopping! !